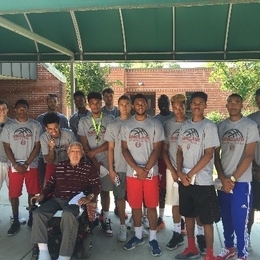 Sinclair’s Men’s basketball teams made their 10th annual trip to the Dayton VA Medical Center Saturday, August 27. They visited with inpatients and their families, as well as many veterans who are alone and do not receive many visitors. Several of the veterans are from the Dayton area, and the team was able to make connections with them that sparked very interesting conversations. Some even opened up to sharing stories of their enlistment. Players had a great time bonding with not only with the veterans, but with each other as well. They developed an understanding and a greater appreciation of our veterans and what they sacrificed to protect this country’s freedom. Over the years the team has made a special connection with Retired Sergeant Charlie Krandall of the 36th Army Infantry Division. The team usually spends the most time with Mr. Krandall as he has become one of our honorary coaches. Sergeant Krandall was a POW for 22 months during World War II in Germany before escaping to safety. The Dayton VA Medical Center proudly serves veterans in southwestern Ohio and Richmond, Indiana through one inpatient facility and four community-based outpatient clinics. They have a proud heritage of providing high quality health care to those who have served our country since 1867. The Dayton VA is one of the three oldest VA facilities, providing continuous service to Veterans for over 140 years. The Dayton VA Medical Center provides comprehensive health care through medical, surgical, mental health, geriatric, physical & rehabilitation services, neurology, oncology, dentistry, and hospice. The Medical Center has 467 hospital beds (225 nursing home beds, 127 Acute Care beds, and 115 domiciliary beds). The medical center also has sharing agreements with Wright Patterson Air Force (military base), in the state of Ohio, and eleven (11) community hospitals. The facility is a national referral center for hyperbaric oxygen therapy. It offers a wide variety of special programs as well, including a hospice unit, geriatric evaluation and management, respite care, an Alzheimer's unit, home base primary care, residential and outpatient post-traumatic stress disorder (PTSD) and substance abuse programs, as well as homeless, sleep disorder, and women's health programs.